Looks like an ice cream cone, but it’s a cupcake! Stand the cones up in a 13x9-inch pan. You will need 2 pans for 24 cones. Prepare confetti cake mix according to package instructions. Fill each cone 3/4 the way with cake mix. 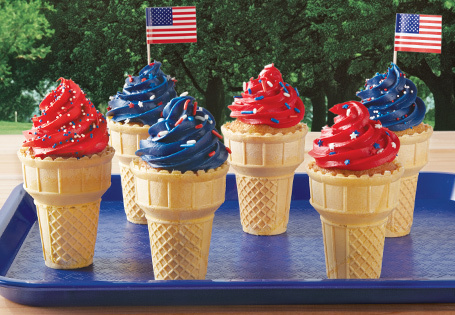 Cool and decorate with patriotic frosting and sprinkles! *These are ALDI Find or Seasonal items that are only in stores for a limited time and may no longer be available.